JJ|LA Chooses 4Wall to Light the Saint John’s 75th Anniversary Gala Celebration | Press Center | 4Wall Entertainment, Inc.
Culver City, CA- The Saint John's Health Center Foundation and Irene Dunne Guild hosted Providence Saint John's 75th Anniversary Gala Celebration last month which raised a record-breaking $1.4 million for the health center. The event featured special performances by Emmy-nominated actor, singer and songwriter Darren Criss and Grammy-nominated singer/songwriter Jake Simpson. 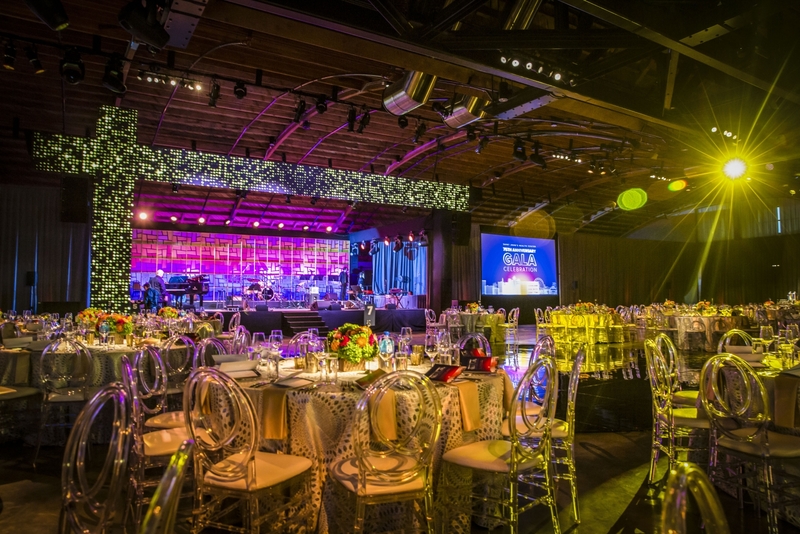 Live event production company JJ|LA brought in 4Wall to light their lavish event that hosted more than 700 attendees. The event brought guests back to the origins of Saint John's with a special homage to the Santa Monica Pier with a welcome arch, food carts, a jazz band and a Ferris wheel. Inside the ballroom at the 3LABS venue was the stage. The stage and lighting design were meant to evoke the future of Saint John's and embrace a spirit of innovation and technology. "To do so, the face of the stage was built with an architectural nod to the front of the hospital building, which has an off-set cross feature as an iconic emblem of its architecture," said JJ|LA Founder and CEO Jeff Consoletti. To mimic this, the front of the stage had this same element but was built completely out of ROE Black Pearl LED video tiles provided by 4Wall. "This allowed us to feature constantly changing creative content throughout the night that surprised and delighted guests not only during the performances but throughout the entire evening," said Consoletti. A Marlite dance floor in front of the stage allowed performers and speakers to venture off the stage and create an immersive stage experience. Martin MAC Auras and Elation Platinum FLX moving lights created reflective and impactful moments throughout the show. The event was a tremendous success and saw its highest attendance yet. Consoletti spoke of the service 4Wall provided, "Our partnership is dynamic and exciting, which brings to life the most innovative and creative solutions for our clients," said Consoletti. "4Wall embraces the wildest of imaginative ideas and helps translate those into industry-leading, exciting results time and time again."